I am not a fan of potato salad. I know people love it. I even have a friend that eats potato salad sandwiches (he mean't to do it)! I just don't like the cold mayonnaise and mustard covered potatoes. All that being said, I loved this potato salad. 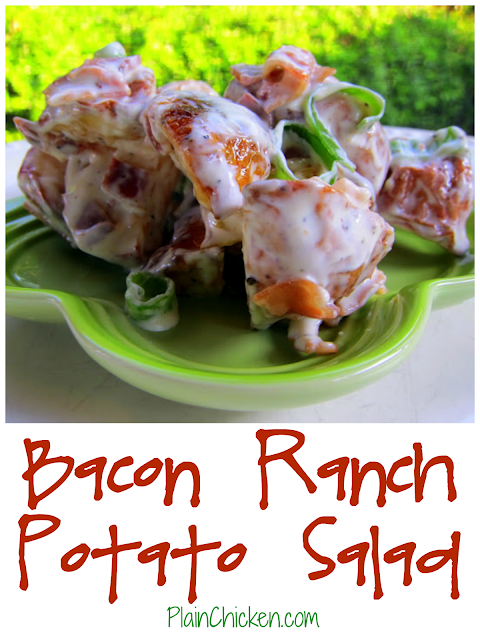 It uses Ranch dressing instead of of mayonnaise and has crispy bacon tossed in. It reminded me of crack potatoes - all it needed was cheddar cheese. I served this warm with the BBQ Chicken from yesterday's post. It was absolutely delicious!! I plan on making it again this weekend for Memorial Day. Toss together potatoes, oil, salt and pepper; arrange in a 15- x 10-inch jelly-roll pan. Bake 45 minutes. Cool 10 minutes. Toss together bacon, green onions, Ranch dressing, and potatoes. Serve warm. Load a helping on my plate, please! Looks delicious!!! Can't wait to try it. Nom nom nom! this looks so yum. amazing ! Made this last night...and I'm sure you could hear all my yummy sounds from there! I swear I could have eaten the whole bowl by myself. Now I can't wait for lunch to have another heapin' helpin'!!! I made this eyeballing the amounts, and added shredded white cheddar, and used "bacon ranch". so awesome!!! !